The bargain wine for this week is the 2014 Pontificis. The wine is a Grenache, Syrah, Mourvedre (GSM) blend from Languedoc-Roussillon area in the South of France. We paid $6.99 from Trader Joe’s for the bottle. 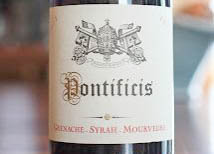 On opening the bottle of Pontificis, the nose was muted with hints of cherry and green pepper. Taking a sip revealed a subtle blend of spice, a touch of fruit, and light tannins. The finish was short and left a slight residue of copper in the mouth. The lack of finish encouraged me to take another mouthful, rather than linger long and luxuriate in the taste. The wine was eminently quaffable and reminded me of sitting in a French café, but without the haze of Gauloises smoke. California Girl comments: I was so surprised by this wine. For the price, it is a real winner! I was surprised by its amazing smoothness and sophistication. The only small thing I thought was a bit disappointing is the finishing flavor of copper which lingered in the mouth. Even saying that though, I would still recommend this as a nice Tuesday night sip. 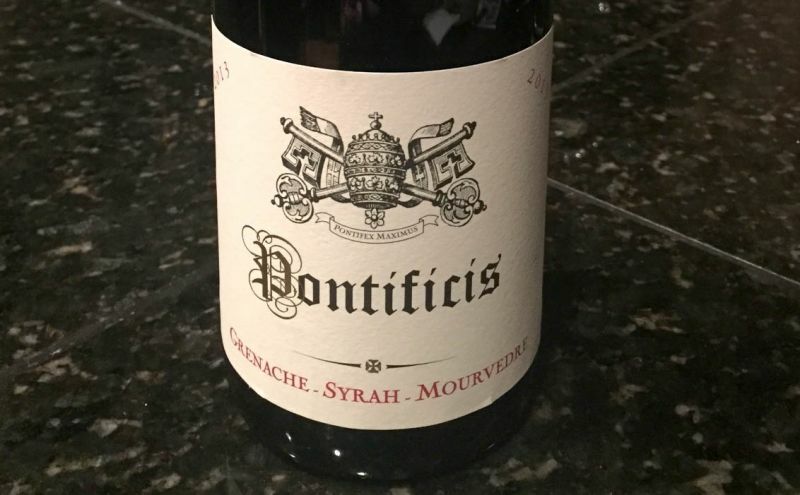 The Pontificis blend is 40% Grenache, 33% Syrah, and 27% Mourvedre. I find the name and the label slightly concerning; both seem to echo Châteauneuf-du-Pape, a more famous and expensive wine producing area in the South of France. It represents excellent value and in its lightness and low fruit stands in sharp contrast to Napa wines. It would pair well with cheese and crackers. I can see us purchasing several more bottles of this wine, as its price and easy drinking characteristics make it an ideal mid-week bottle. The wine neither developed nor deteriorated after being left for twenty-four hours; another plus for a sip during the week.